Don’t miss my guest post (a first for me!) 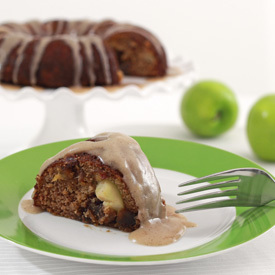 along with the awesome recipe for my new Paleo-friendly and gluten-free apple spice bundt cake on Christi’s wonderful site! Be sure and try this spice cake…it’s one of my best Paleo-friendly desserts so far. No refined sugars, gluten-free, moist and delicious with a maple glaze that I think is just amazing! Enjoy! Note: You might want to make a little extra glaze. I found everyone likes a little extra dollop on their plate next to their cake! Enjoy Newbies! This recipe is a keeper! What could I use in place of coconut butter and Palm shortening in the glaze? I haven’t made the glaze any other way, but I’m sure you could sub grass fed butter for the shortening, and taste to see if you need the coconut butter. Michelle, you could make a glaze with either of those. Add a little tapioca flour if you have it if you need to thicken it a bit. Had to also comment on this one–it was one of the first dessert Paleo recipes I attempted. I used a standard Bundt pan, and it came out fine (just a little short!). It is a bit of effort but OMG is it ever worth it! So incredibly moist! Great recipe Trina, thank you! For a variation I added cranberry sauce, yum, yum, yum!!! What size bundt pan do you use? A normal 10-cup pan would seem too big for only one cup of flour(s).